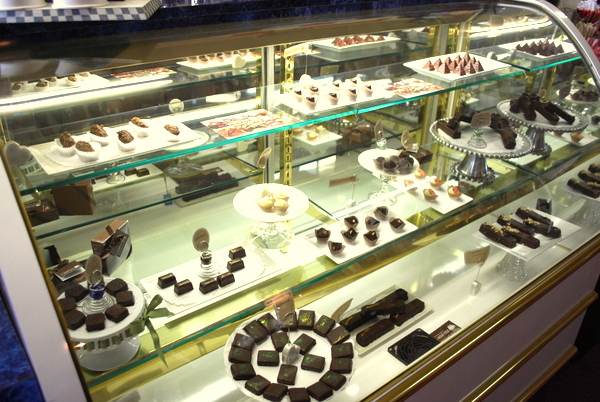 Our little shop is hopping this week, with a fabulous menu of lunch specials and new products arriving, including a whole case of unbelievably delicious hand-crafted chocolates and decadent desserts from our friends at Coastal Mist Chocolates in Bandon! (see above) This little delicacies are beautiful works of art! Also in the shop are some amazing new bags & backpacks from Rice Love. I met these folks a couple of months ago on one of my trips and fell in love with what they’re doing to create work and educational opportunities for women in India. Each bag is made with recycled rice bags, and every bag sold purchases an additional bag of rice that goes right back to their village. Mon Ami is now supporting cottage industry projects for women that support recycling & repurposing in India, Nepal (felted bags & purses), Haiti (punched tin artwork), and Vietnam (planting buckets made with recycled tires). Rice Love is a new company, less than a year old, but has already made a huge impact in two villages. We’re excited to partner with them and support their efforts! Here’s this week’s lunch specials at the Mon Ami Cafe, courtesy of the always creative and ever stylish fashion maven, Chef Diane! Greetings! We hope you all had a fantastic time during our Rhody Festival weekend! A big thank you to all the many volunteers who worked hard to make it happen! As we head into another holiday weekend, please be advised that Mon Ami will be closed Saturday through Monday. Estate Sale: This FRIDAY & SATURDAY our team will be holding a sale at 937 First Street in Florence on behalf of Kelly Riggs (late of Kelly’s Cantina fame). This riverview bungalow is absolutely stuffed with treasures – home decor, furniture, patio furniture, yard art, clothing, kitchen-ware, bar-ware and more! We’ll be posting pics to the website tonight and sending out more information Thursday morning. Stay tuned! 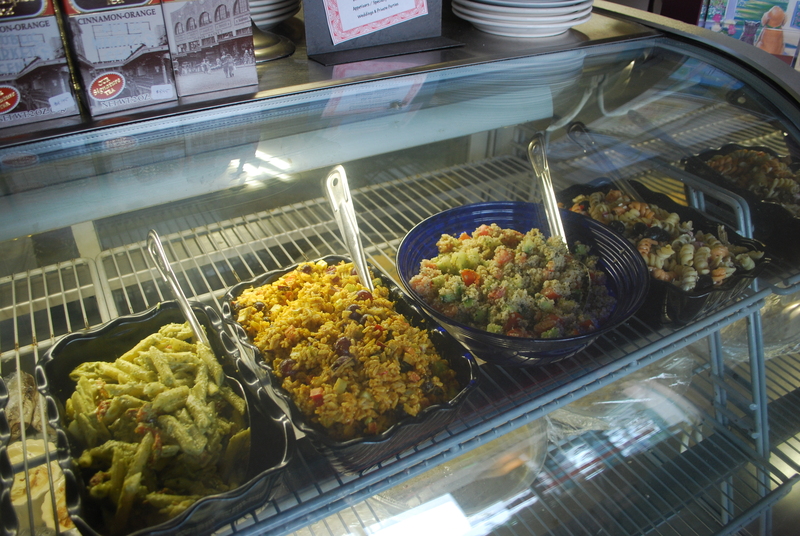 From Mon Ami Cafe …Diane is cookin’ up some favorites this week! Greetings! It’s a beautiful Monday morning here on the Oregon Coast! Here’s a quick run-down on this week’s happenings in Mon Ami Land. TWO ESTATE SALES! This coming Friday & Saturday, May 1&2, my team will be conducting two estate sales – one in Idylwood and the other in Seawatch, both a short distance from each other on Rhododendron Drive. I’ll be sending out a web album on Wednesday. Both homes are full of lovely and useful items – furniture, beautiful crystal and glassware, beds, gardening tools, outdoor furniture, civil war books …. stay tuned! Mother’s Day High Tea … Saturday, May 9, seatings at 11am and 1pm. Diane is putting together a spectacular menu for this annual event. Some of you folks have been attending this tea since we started it in 1999 – a 17 year tradition! I keep saying that one of these days I’m going to put together a picture album of all our tea guests through the years. We hope you can plan to attend this very special event. Rumor has it that Diane is planning a showstopping grand finale dessert …. 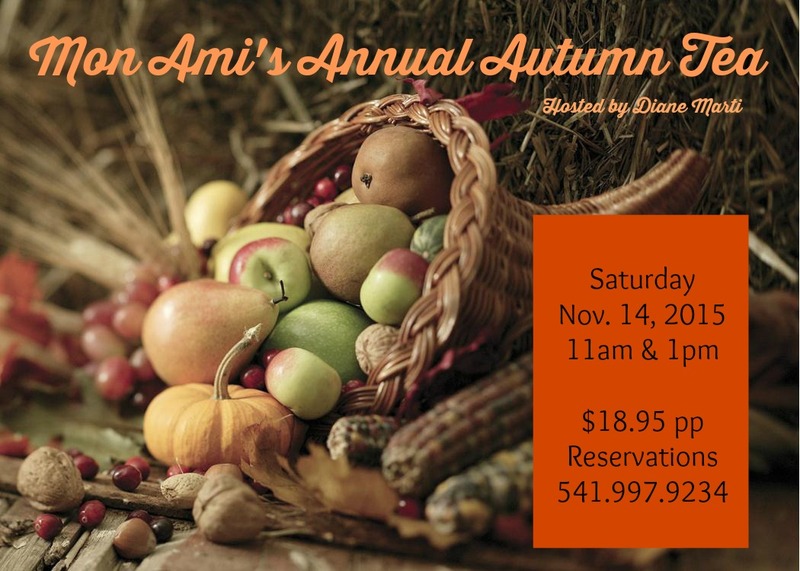 Reserve your table at 541-997-9234! 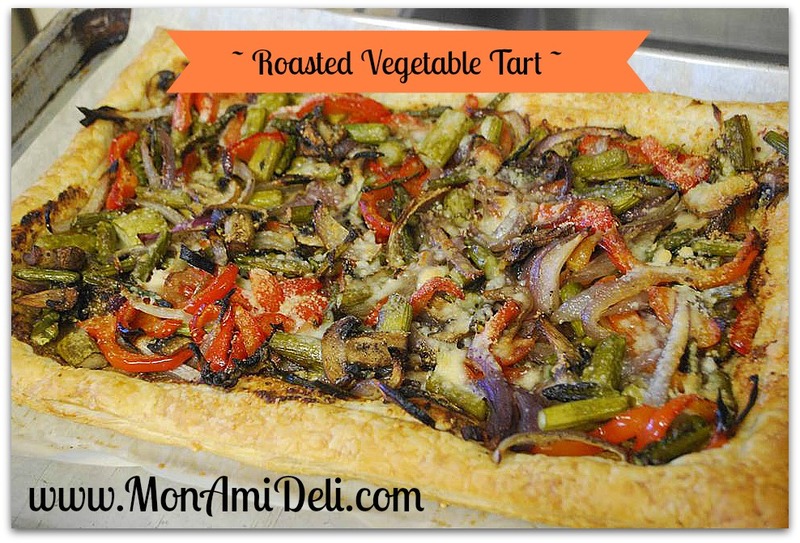 From the Mon Ami Cafe … this week Diane introduces Mon Ami’s new spring & summer menu! Here are this week’s daily specials – sounds delish! And finally, tickets are now available at the FEC box office for this year’s Rhody Court Showcase. I’ve had the great pleasure of working with the senior court boys and girls for the last several months and can promise you that they’re going to be putting on a pretty doggone spectacular show! It’s Wednesday, May 6, at 6:30 p.m. This year’s Rhody Festival is in its 108th year, and what a wonderful tradition it is. We’d love to see a packed house for our Rhody Court! Warm greetings to you this morning! As usual, things are bustling here in the shop. Diane is busy preparing delicious a menu of lunch specials for the coming week (including a to-die-for chocolate cheesecake), and the gang is hard at work moving several new items of estate furniture into the shop as well as setting up for our upcoming estate sale this Friday and Saturday here in Florence. Never a dull moment around here! Upcoming Sale … this Friday & Saturday, our team will be conducting a complete home liquidation at 04878 Sea Pine off Rhododendron Drive in Florence on behalf of Marge & Joe Temple. This is a TERRIFIC sale – lots of quality used furniture, like new queen & twin beds, an RV barn full of tools, fishing gear, BBQs, dining sets, occasional chairs, and tons of great household goods. You’re gonna love this one! Hours are 9-3 both days. We’ll be posting more info and a web-album mid week for your viewing pleasures. 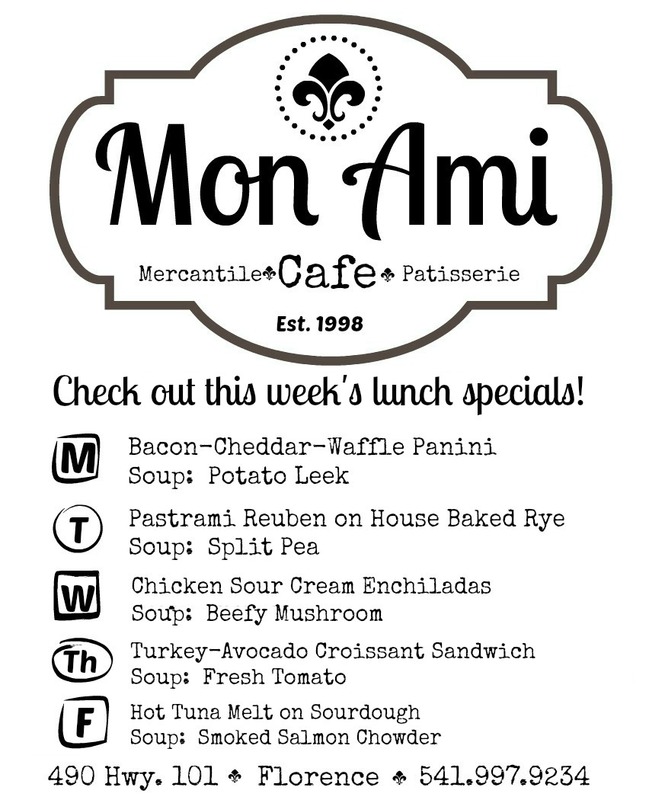 From the Mon Ami Café … if you missed last week’s Souper Salad specials, fret not! This week Diane is cookin’ up some fabulous home-town favorites, including her much-raved-over Chicken & Dumplings and Sweet & Sour Meatball Hoagies. And don’t forget, our award-winning clam chowder is gluten-free and offered on the menu EVERY DAY! This Week at Mon Ami! Greetings! And a big “merci!” to all of you who joined us for our Business After Hours on Thursday! It was great to see so many familiar faces, and meet some new ones, too! April 3 & 4 – Estate Sale in Eugene .